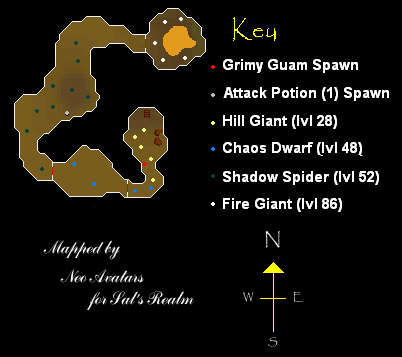 The Wilderness Fire Giant Dungeon is located in Members Wilderness South of the Anvil and Mine that are located a tiny bit west of the Mage Arena. To enter the dungeon you must go down a staircase situated inside an old, crumbling building. Once within, you will be attacked by several level 28 Hill Giants or some level 48 Chaos Dwarves. As with most dungeons, the further in you go, the more deadly the monsters are. The Hill Giant is the easiest monster in the dungeon and there are five of them. The Chaos Dwarves are level 48 and there are two in the room with the Hill Giants and two more in the second room through the gate. The Shadow Spiders are level 52. There are nine Shadow Spiders and they half your prayer each time one attacks you if you don't have a health bar above your head. If you have an odd number of Prayer Points left you will keep the odd one. This means that they can never completly drain your Prayer, but they can get it down to 1. The Fire Giant is what the dungeon is named after. They are level 86 and there are five of them at the deepest part of the dungeon. 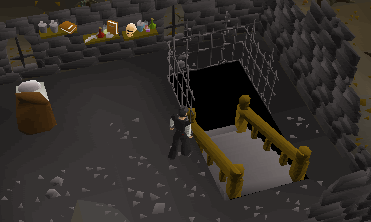 When going into the room with the Fire Giants it is best to go through the gate just one square and then shut it again so that no Shadow Spiders can follow you in and drain your prayer. As well as Monsters in this dungeon there are also two spawns of Herblore items. One is located in the room with the Hill Giants and one in the room with the Shadow Spiders. The first spawn is a Grimy Guam Leaf. It is beside the West wall in the room with the Hill Giants. The other spawn in the dungeon is an Attack Potion (1). It is in the room with the Shadow Spiders and is useful for using to increase your Attack level while training on any of the monsters in the dungeon.